You are currently browsing the Archaeofacts.com archives of Musings for the day Thursday, May 4th, 2017. Of course, what I noticed first were the plants growing in the wall-cracks. Next I noticed the pierced spheres. I don’t know what they represent. They’re in a line following the pediment arch and also on the “points” of the Corinthian column details. 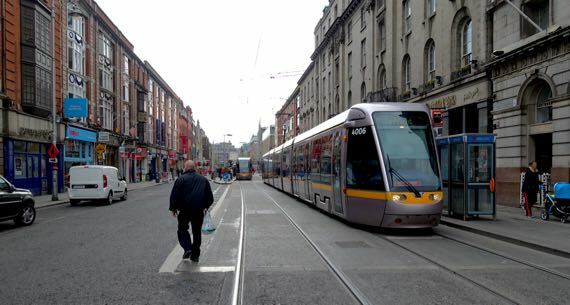 This street is perpendicular to O’Connell, and the tram right-of-way is functioning here. Such a contrast to the upheaval on O’Connell. First stop: the National Museum of Ireland—Archaeology. 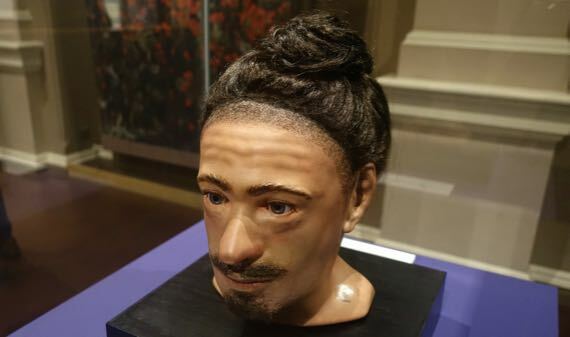 Here’s a reconstructed bogman with his fancy hairdo. The poor fellow (gruesome death) was found during mechanized peat harvesting, and was about 25 yrs old. 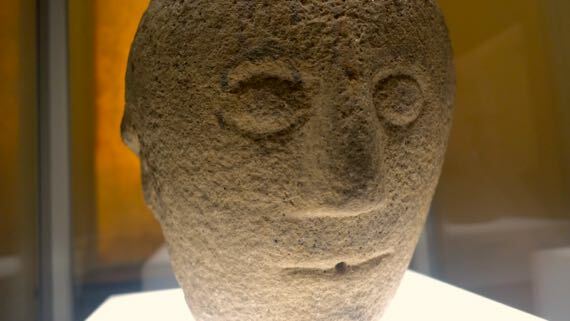 He’s called Clonycavan Man (Early Iron Age, 392–201 BC). Mr. Clonycavan’s hairdo is fascinating. The zone along the hairline were cut short, and the rest of the hair was long and twisted and affixed to the top of his head. It was held in place with a substance that included pine resin and plant oil; the resin could not have come from Ireland, and instead came from the Iberian Peninsula or what is now France. We know from other exotic items that there was trade during this era along the western European Atlantic façade, so this is not entirely unexpected. After all, cosmetics frequently incorporate rare and foreign materials (think ambergris and frankincense). Contrast reconstructed Mr. Clonycavan with this stone face, dated to the 1st or 2nd C AD. The stone has three faces, carved so evenly spaced that if you eye one face dead on, you can’t tell the other two faces are there (you can see a hint of another face on the left margin because I viewed this one slightly obliquely). This is the only face with the hole between the lips. The label gave scant information, and nothing about the context of the triple-face-stone. Jumping forward again in time, this is a close-up of the medieval Cong Cross. 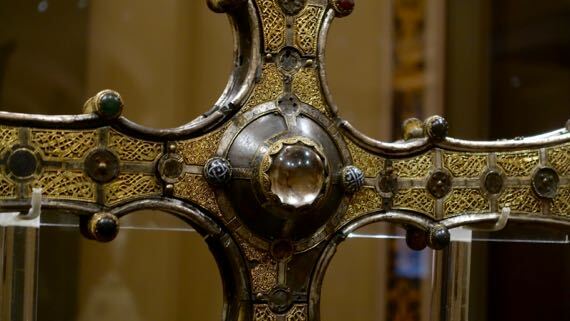 It was made to house a piece of the true cross acquired in 1122 by Toirrdelbach Ua Conchobair (1088–1156), who had unified Ireland (or most of the people of the island, and at least nominally), in ~1120. The cross is of oak wood covered with sheets of brass, and overlaid with elaborate filagree decorations and set with cast brass and enamel hemispherical bosses. At the enter of the cross is a rock crystal, and the piece of the cross was set behind it, so that I suspect it acted in part as a magnifying glass, but also obviously as protection. The filagree is in what is called the Scandinavian Late Urnes style, very curvy and ornate, and requiring considerable craftsmanship to create. The cross was made to be socketed onto a pole and used as a processional cross. The cross was first installed at the church at Tuam, then moved to nearby Cong Abbey. Both the wood-fragment and the cross symbolized the piety and legitimacy of the king, and united the civic-ceremonial realms. Often, one or more brothers or sons of such kings were priests, further controlling the two spheres of leadership. If Cong seems a strange word for Irish, it’s a corruption of Cúnga, referring to the narrowing of the river at this location—the abbey was actually built on a small island, with constricted river-courses flanking it. 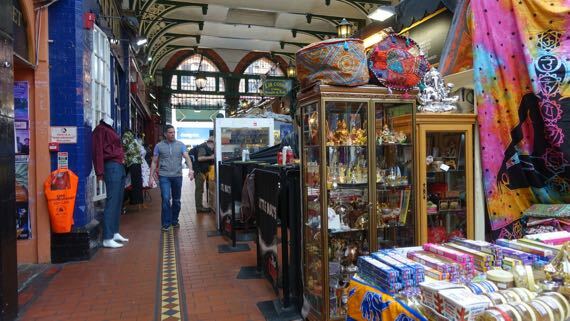 Leaving the museum, we moseyed on through a casual shopping arcade, with all manner of items available from informal booths. Zero purchases. We spotted this memorial to the 1916 Easter Rising, a particularly bloody week in the violence that ultimately lead to Irish Independence, which achieved constitutional legitimacy in 1922. It opened on the centenary of the Easter Rising, in 2016. 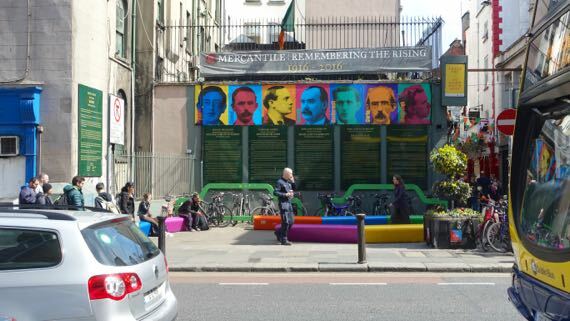 The central blue face is that of James Connolly, who had the press and newsprint that was used to print the Proclamation of the Republic, which was a trigger event for the Rising. We saw an original yesterday at the Print Museum, very yellowed as it was light-weight acidic paper; only 30 are known to have survived of the 1000 printed. 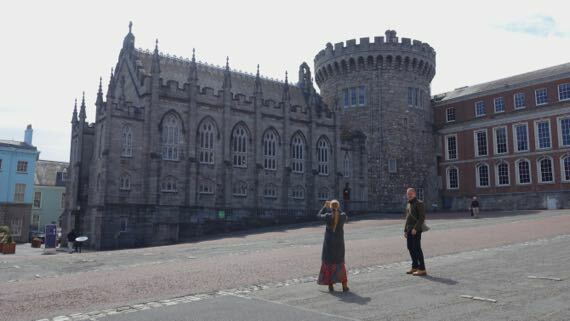 This is the last rise to the east gate into Dublin Castle; the area is called the Lower Castle Yard. Castles are built on prominences (either natural or artificially enhanced, doncha know.) The round tower is the last of the medieval towers to survive, not only of the castle, but in all of Dublin. The medieval castle had four substantial corner towers (this is one), a pair of smaller towers flanking the north gate, the only entrance, and a single smaller tower opposite the gate. Flanking this building are two present gates to the castle courtyard (Upper Yard; foreground). The one on the right, now shrouded to contain construction debris and mask the workers, is often seen in movies, etc., and is the principal ceremonial entrance. A female figure holding a pair of scales surmounts it. The clock-tower building is called Bedford Tower and dates to the 1750s, along with all the Georgian-style buildings facing the yard. In this yard, the English soldiers marched and paraded, as this was this was the seat of English administration of Ireland. 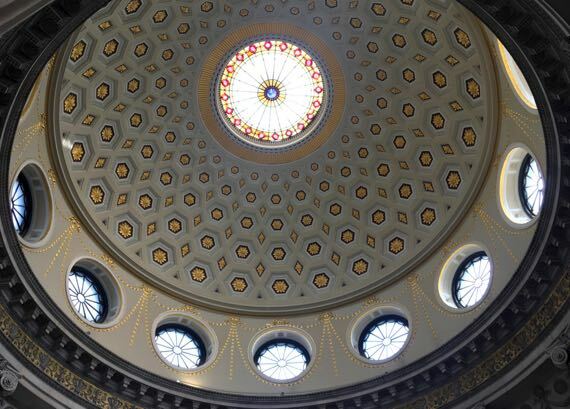 Just NNE of the gate, and below, is the Dublin City Hall; here’s the interior of the rotunda. I could see its curves on the outside, so of course I had to check it out. Unlike the library reading room, this was empty of people except for two tourists resting their feet by sitting in folding chairs standing encircling the base of the rotunda. The building was built over the decade from 1769 to 1779. The architect originally intended the central skylight to be open, as it is in the Pantheon, but: Ireland/rain. 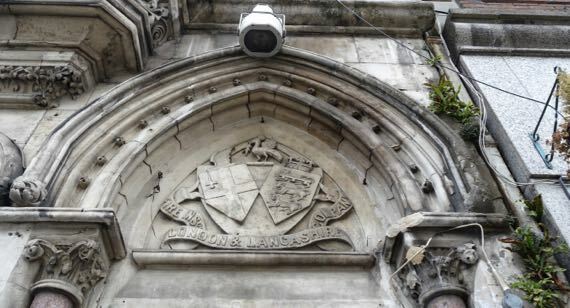 The building was then the Royal Exchange, functioning essentially as a marketplace for businessman making transactions—for the exchange of paper and not goods. 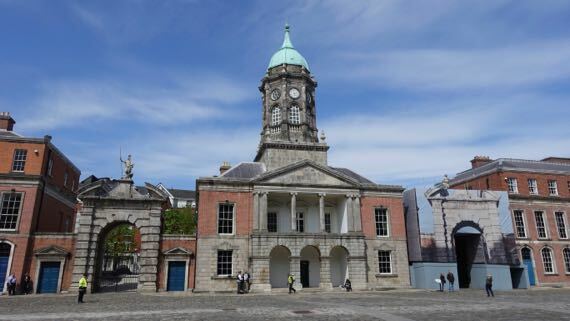 Dublin’s city government bought the building and remodeled to be the city hall in the early 1850s. Irish rebels (from the British point of view) held this building during the Easter Rising, so were extremely close to the British citadel; most of the building’s occupants were female clerical workers subjected to a 12-hour siege by British troops. I took this picture of the “no sitting” spikes because they were so…uncompromising. 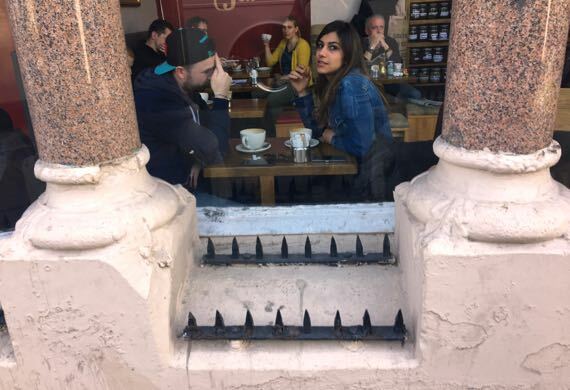 This attracted the attention of this café-ista duo. BTW, don’t count on any more double-posts like I did yesterday. Anyway, this one is wordy enough for two….